Archives and Manuscripts will publish a special issue on born-digital records in literary and publishers’ archives in July 2019. The digital revolution has profoundly affected the ways we encounter archival documents. Yet, archivists and literary scholars rarely "sit at the same table," and this lack of dialogue has an impact on issues of access, particularly in the case of born-digital materials. The special issue in Archives and Manuscripts will explore these issues, and attempt to find solutions that involve both archivists and scholars. There is a possibility of producing an edited collection (e.g. Book) from a special issue with Taylor and Francis. 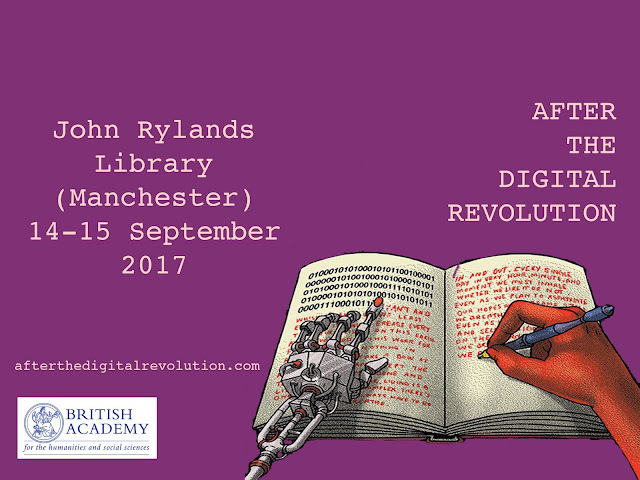 The list of contributors will be drawn from the participants at the two “After the Digital Revolution” workshops, funded by a British Academy Rising Star Engagement Award awarded to Dr Lise Jaillant. In addition, anyone else with an interest and expertise in born-digital records is welcome to submit an abstract for consideration. If you would like to contribute an essay to this special issue, the next step is to send a 300-word abstract and CV to l.jaillant [at] lboro.ac.uk by 1 February 2018. Complete essays will be due on 1 December 2018. A typical paper for this journal should not exceed 10,000 words, inclusive of the abstract. How can we improve the preservation and access to born-digital records in literary and publishers’ archives? Missed the second workshop "After the Digital Revolution"? Here are the slides of five participants: Andrew Prescott (University of Glasgow), James Baker (University of Sussex), Peter Chan and Josh Schneider (Stanford University), and Amy Chen (University of Iowa). Click on "Read More" to view the slides. Principal Investigator, AHRC Leadership Fellowship. "Survival of the Weakest: Preserving and Analysing Born-Digital Records to Understand How Small Poetry Publishers Survive in the Global Marketplace."